Stress is a responsive state to experiences (whether bad or good) that is intended as a safeguard. When we become stressed, the body releases hormones to increase our heart rate. When our heart speeds up, so does our breathing, and these two reactions pump higher levels of oxygen to the brain for better decision making. While this is happening, blood sugar rises as a result of glycogen, fat and protein stores being broken down to provide quick energy. Blood is also shunted away from the gut (affecting digestion), and clotting occurs more rapidly to prevent blood loss if we were to be injured. Muscles contract to protect themselves from possible injury, and this is how we accumulate so much muscular tension. 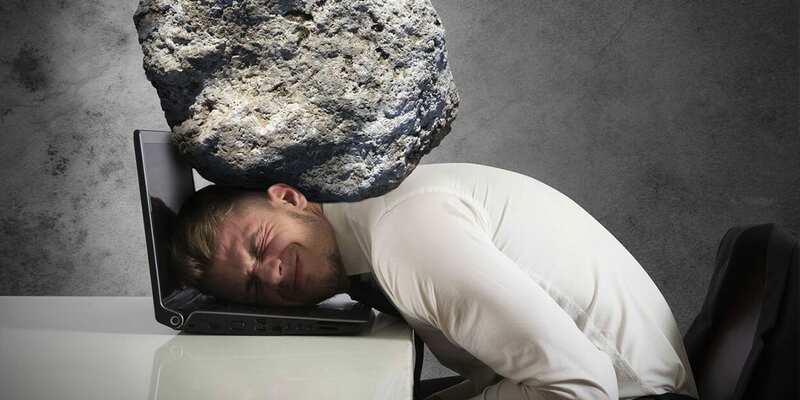 Even if we’re sitting down in a climate-controlled cubicle all day, our muscles can become strained and solid as a rock. If you’re constantly under stress, your muscles don’t get the chance to relax. Tight muscles will cause all sorts of aches, pains, blockages, and even pull our bones out of alignment. The reproductive system becomes frazzled, causing unhealthy fluctuations in hormone levels which impact sexual desire and performance. Women can experience menstrual irregularities, or even a complete absence of a menstrual cycle. During a stressful time, miscarriages are not uncommon. The immune system goes into overdrive, inducing an inflammatory response to foreign invaders. This actually makes us more susceptible to illness and can make any pre-existing conditions flare up. Adrenal glands release adrenaline and cortisol, effectively placing us in a “fight or flight” response. 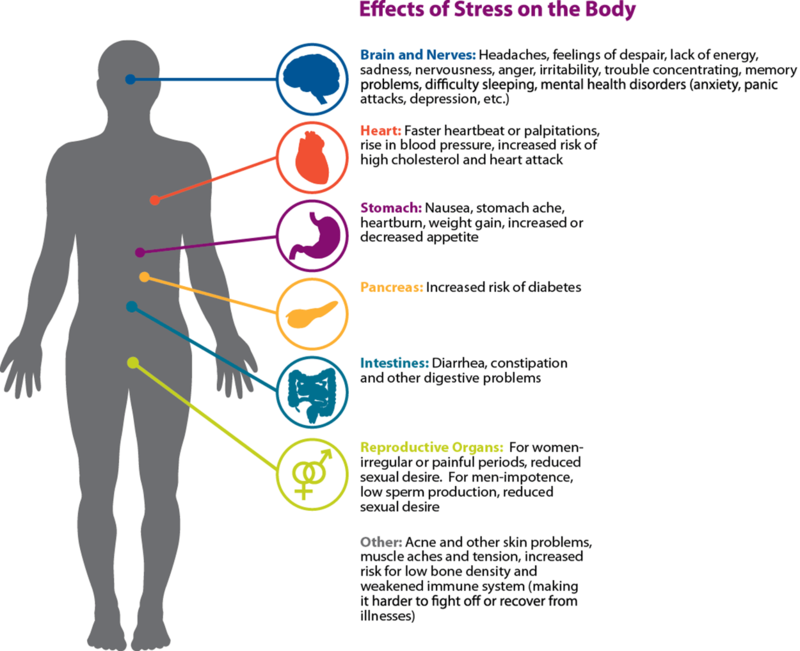 Medically, stress is thought to be the cause of a whole host of short-term and and long-term issues. The longer stress is present within us, the more at risk we become. There are lots of stressors in life that can cause us to have this extreme reaction, and it’s simply our natural survival mechanisms coming into play. Unfortunately, this doesn’t serve us well when we’re not trying to fight in battle, or run away from a hungry bear. Many of us get too stressed, for too long, and because we’re so busy, we don’t stop to check-in with ourselves. This type of “under the radar” stress can become chronic, eventually manifesting as disease. Stress is simply not manageable in prolonged bouts. The body has it’s limits, and living a stressful lifestyle will definitely produce debilitating symptoms sooner or later. Here’s the catch: Life IS stressful. No matter what you do for a living, or who you are; bad things happen. Not all the time, but we all have our fair share of mishaps. Things go wrong. Pain is felt, anxiety is felt, meeting deadlines causes stress. Life is a constant balancing act, and we don’t always get it right. Sometimes, we’re thrown into situations that are just too much to handle, and in these times we must treat ourselves with the utmost respect and care. For if we collapse, we’re of no good to ourselves or anybody else. At The School of Natural Health Sciences, we offer diploma-correspondence courses in Stress Management, Professional Relaxation Therapy, Mindfulness, Yoga and Meditation among 50 other holistic courses. Study with us and embark on a journey to a healthier lifestyle and career path. Getting qualified has never been simpler!